NEW Purex® PowerShot™ is a super-concentrated liquid detergent with auto-dosing technology that provides a no-mess, no-guesswork solution to laundry care. It’s easy to use, too! 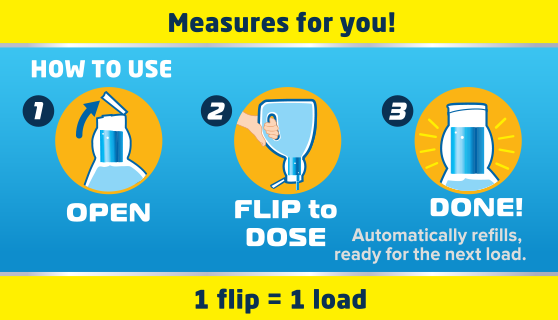 Just Flip, Dose and Done! I'll be the first to admit that I never use the measuring lid that comes with most detergents. Some residual is always left in the lid and then it leaks all over your bottle after you put the lid back on. I usually just pour the detergent in the washer and never measure, but even though I am pretty good at eyeballing, this sometimes leads to me putting too much detergent in the wash! When that happens, I am left with a very sudsy wash, and then the clothes have to be rinsed twice before I put them in the dryer to remove all residue. Purex has come up with a way to help people like me with the new Power Shots which is coming soon to stores close to you! This nifty little bottle allows you to just flip the bottle over, and pour. The chamber then automatically refills, as you can see in the picture the bottle is now ready for me to pour and wash again! It does all the measuring for you, and does not leave a huge mess like other detergents do. Purex has also been on of my favorite detergents for a long time! It has a very fresh smell, cleans my clothes amazingly well, and is also very affordable. I know that is very important to a family on a budget like my own. Be sure to like Purex on Facebook and Instagram @purex. Disclosure: The above item was received from tomoson.com in order to facilitate review. I have not been compensated for this post. Top Notch Material blog will always provide honest opinions, beliefs or experiences on products reviewed. We will only recommend products or services that we feel are of benefit to our readers. If you have any questions, please contact me at nursemommypaige at yahoo dot com. The disclosure is done in accordance with the Federal Trade Commission 10 CFR, Part 255 Guides Concerning the use of Endorsements and Testimonials in Advertising. Very cool, I haven't bought laundry soap in forever, this would definitely make doing laundry one handed super fast and easy! This is pretty cool..I haven't seen this in the store...would have to look for it.